I'VE been intrigued with the idea that paint is paint and the only thing that distinguishes oils from acrylics is the medium. They have different drying times, true, but with oils drying time can be adjusted by additives such as cobalt dryer. I paint rapidly, wet into wet, so I felt that switching to acrylics wouldn't be that difficult. I stretched a 36" x 36" canvas and gessoed it. I then drew a grid with lines every 6 inches. I transferred my drawing and begin glazing in my underpainting. I painted for about six hours carefully glazing and scumbling until I achieved the needed effect, a very thin but accurate rendition of my reference. I didn't worry about surface texture or virtuoso brushstrokes. I worried only about painting values and hues. I then wet my canvas by spraying on a thin layer of water from an atomizer. I then mixed up a series of values and hues carefully using my nine value grayscale to carefully match value. I mixed my colors with my left hand and swiped my brush across my palette knife to load my brush with broken color. I then very quickly applied the paint into small, discrete areas. This breaking up the painting into small areas was the major difference from painting in oils. With my initial layer I did occasionally notice a border between the different areas. But on the second application of paint these borders were eradicated and I could see no transitions. I was surprised at how similar painting with acrylics is to painting with oils. I may continue in acrylics for awhile to see what the medium has to teach me. It should be an interesting journey. 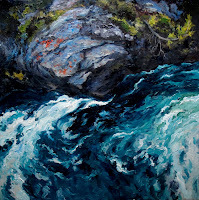 (Click on the image of the painting above, Water and Rock, 36" x36", acrylic on canvas, to view texture). I've been following your blog for a little while now, but hadn't taken the time to watch your Youtube videos and really read things with the intention of learning. What a mistake! Your videos are brilliant, and I will definitely be coming back to learn how you paint and see more of your work. Many thanks! I hope you find that the ideas advance your painting abilities. Let me know how it goes. Hello, Just wanted to say, I really enjoy your YouTube video's and have recently started reading this blog. I'm self taught, working with acrylics and have many problems with the finer points of painting. I am looking forward to experimenting more with light, colour and shadows. Thank you.